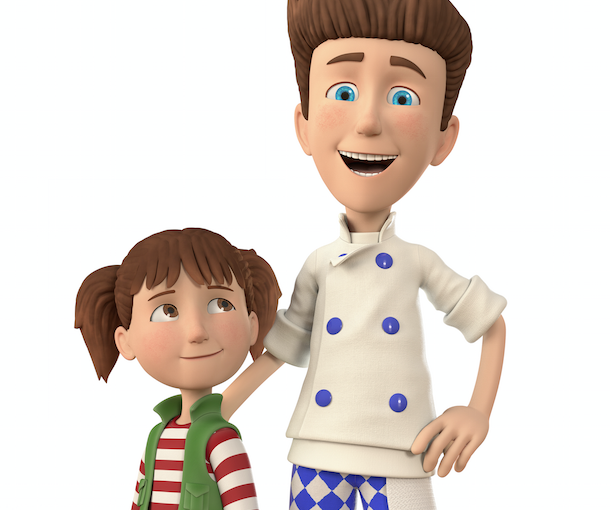 UK broadcaster Channel 5 has greenlit production on a 52x11mins animated preschool series about an energetic chef and his daughter. Shane the Chef comes from UK-based producer and rights management firm Hoho Entertainment, with Cardiff-based Cloth Cat Animation producing the episodes. The first episodes are due to delivery this autumn. Creative Europe has supplied additional funding and the Children’s Food Trust is lending support. Hoho claims the series has attracted “significant interest from international broadcasters”. Shane the Chef, created by Andrew Wildman and Simon Jowett, follows the foody exploits of ambitious chef Shane and his daughter Izzy, who run a restaurant in the town of Munchington. Hoho, the UK-based prodco Oliver Ellis and Helen Howell co-founded in 2011, first pitched the concept to buyers as Jeff the Chef at Cartoon Forum the same year. At that point, Nickelodeon, which is now a sister of Channel 5, was backing the project. Milkshake! commissioned a full series series in 2015, with pre-production work beginning then. Production has now begun after the production structure was finalised. For Channel 5 and its preschool strand Milkshake!, the greenlit is one of the first its given since CBBC coproductions chief Sarah Muller became head of children’s in September last year. “It is really exciting to be supporting such an ambitious UK animated series which so directly engages our audience with food,” she said.